Agile, Adaptable, Jovial, Tenacious, Dreamer. At the age of 30, I decided to make my Homebodii dream a reality. Being new to the industry and without a design background, all I had was my own determination and (with a toddler to top it off), I needed every bit I could muster. I first launched at a local market with the help of a local dressmaker. 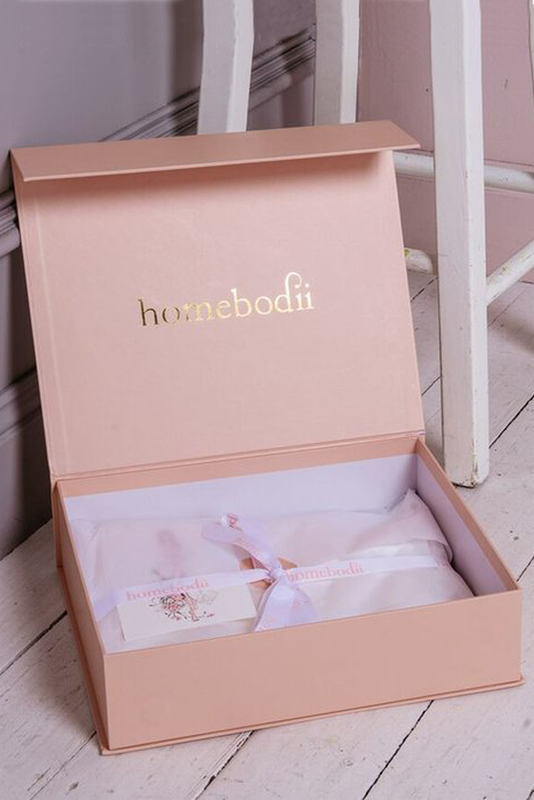 The direct feedback I received in these humble beginnings was the best market research I could have asked for and as a result, Homebodii began to mature into something very special. With determination and perseverance, Homebodii went from our spare room to a small factory and now a bigger factory with our own showroom and leading national and international stockists. I managed the business with my sister Marianne for the first two years, which roughly translates to a 24hr email service, first name basis with couriers, and wearing a measuring tape around my neck as my staple piece of jewelry. What we did in our early days was listen to what our customers wanted, and offered them an excellent personalised service. 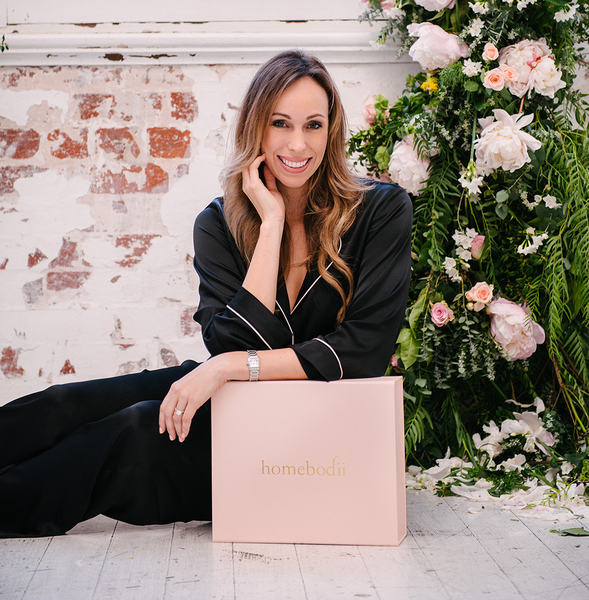 Organic growth and word of mouth has been a big factor in the success of Homebodii, coupled with being picked up by international stockists including Revolve Clothing and Anthropologie, which put us on the map globally. Ten years ago, I was pregnant with my second child and working as a PR consultant for a French beauty brand. It’s so funny, it’s exactly like that famous speech by Steve Jobs about connecting the dots in your life. This was truly a great foundation which would later serve me enormously to create my own brand. I learned from industry professionals about the importance of a quality product and excellent customer service. Homebodii was still a dream that was floating around in my conscious. I am not really a big planner, I truly believe that you need to surrender to the universe and let the ebb’s and flows of life take you where you meant to be. In saying that, hard work and determination must be applied, and a true passion for what you’re doing. I went in with the intention to make garments that make women feel beautiful. Success to me is a feeling of fulfilling a desire or wish and having an outcome that enriches you, those around you and makes you grow as a person. Life is a journey and all the curves and unknowns, ups and downs are what makes it exciting. I don’t see success in a material sense but in having a fulfilling lifestyle. Success to me is having a great family, a wonderfully supportive network of friends, a rewarding job and being healthy. So in that sense, I do feel successful. I think everyone defines success differently, but at the end of your life, I don’t want to have any regrets and rather spend my money on amazing experiences than designer handbags…ok I have a few of them too! I’m aspiring to a work/life balance and also to take the time to give back to the community. I have a degree in Communications and PR which really helped me early in my career. However, the best teacher, for me, has been life itself and hands-on job experience. There’s nothing like jumping straight into the frying pan to prepare you for real-world situations. Our Instagram is filled with photos of women wearing our garments, it is very pleasing and the compliment is never lost on us. We love seeing Homebodii robes being worn for memorable occasions, including bridal parties, Sunday lounging, on holidays and at the races. It’s a great feeling knowing that our customers feel beautiful in our pajamas and dresses because we truly believe what we wear is a reflection of how we feel. We were also very excited to take Homebodii to the catwalk at NYFW last month, showcasing Australian designs on the international stage. I had my mum and daughter front row and it was such a great experience and wonderful to share with my family. Tell us about your workspace - and what inspires you about your workspace? I just adore our workspace, it is an open plan factory, with a purpose-built showroom at the front. The team and I are very close and coming to work is a joyful experience. Fabiana our Brazilian dispatcher moonlights as a masseuse so that always comes in handy. The front of the factory has been converted into an elegant showroom and truly reflects the Homebodii aesthetic with the blush details, white walls, large mirrors and furnishings. Last year we invested in the most divine large mirrored table, it has become our signature centrepiece and the first thing our customers comment on when they enter the store. With business growth comes more challenges, for us this has meant navigating to a bigger premise, investing in more staff. Finding our way through the minefield of international business and logistics - in addition to all the intricacies of manufacturing your own label from scratch. I have had to rely more on the team and learn to have faith in their abilities and implementation of my vision for the brand. When was the last time you were overwhelmed & cried from something provoked by work / work load? It has been my children that have really pulled me into line here, they hate nothing more than my being distracted, and (even worse!) on my mobile. Even though I explain that it’s work, I have had to set boundaries on technology. Running an international business with stockists all over the world, and with emails flying in all day and night, it is tempting to continuously be checking my phone, but I fell into that trap early and nearly burnt out. The body needs time to switch off, recharge and realign. I find reading and just being with my kids the best ways to truly relax. Yes, it most certainly has, in our family the traditional roles have altered slightly. My husband has definitely stepped up and is taking the children to school more, watching them while I go on business trips and there is a general feeling that this is a marriage of equal contributors. He has gained respect for me as an individual - I have been married for 11 years and together since I was 19, so we have been through many chapters, from raising small babies, working part-time, juggling a new business etc. The relationship has matured and strengthened along the way. Deadlines and moments of inspiration when I have to get out the notepad and jot down my ideas are the cause for most of my sleepless nights. Also, I am a sucker for a great book, that can keep me up until 2 am easily! I wouldn’t change a thing; every year and every experience has been a stepping stone to where I am today. The life I thought I wanted at 21 is so far from where I am today and I am much happier with it. Life can surprise you and is often better than what you had planned out for yourself. Don’t feel like you’re running out of time to pursue your dreams, there is no deadline on your desires, next year you will become pregnant and be unsure of your path, things will turn up that you could never have dreamed of, so stay positive and don’t worry so much about your weight… you look great. Enjoy that chocolate and cake in your 20’s - it gets harder to keep it off in your 30’s! I think Jessica Alba has created an amazing empire out of a personal passion for chemical-free household items. I am drawn to her wholesomeness and naturalness; in a world of female celebrities, I think she makes for a great role model for young women. Elle MacPherson is another Australian that has continued to be a force as a career woman, recently re-inventing her brand and proving she is not a just a pretty face. In a recent interview, I loved how Elle says how she makes her boys write personal thank you cards for any gifts they received or she gives them to charity. In a world where we expect so much of others gratitude is such a lovely gesture. I truly admire confident women, independent women and kind people in general, you never know who you are speaking to, and it costs nothing to smile. Not sure who said it, but I believe you can have it all just not at the one time. Something always has to give. That the fashion industry is all glamour and fun! It’s long days, incredibly tough and very fast paced. In one day, out the next. Industry statistics are that only 1% of new fashion labels make a profit by year 5 of business. The fashion industry is one of the hardest businesses to be in. In “The Fashion Designer’s Survival Guide” by Mary Gehlar she summarizes that starting a fashion label is like being the actor that moves to Hollywood. How many actually become a star. The truth is it is really that hard. I would have to say, start small and be true to yourself and your aesthetic, don’t try to be like anyone else. Stay focused, grounded and remember the people that helped you in the early days. Oh dear… that’s a hard one. How can you measure the sweat, tears, joy and sacrifices? It has been an amazing journey and one which has helped me grow as a person. It certainly hasn’t been easy by any means. I couldn’t start it all over again today at 35. But going in with a little blind faith was probably a good thing for me as it is much harder than I anticipated. However, the rewards are also very sweet. I like the quote ‘Don’t just have a job, have a purpose’ - What do you want your legacy to be?Foremost a loving mother, wife, friend and a person who created beautiful sleepwear and dresses that brought a sense of joy to the women who wore them. It is important to share your knowledge and encourage other women. We live in such an exciting age where information is so accessible. In our society women are free to live the life they choose, it’s hard to imagine that it’s only been a hundred years since women were allowed to vote. We need to continue to foster and support each other. I wish I had a blog like this to read 5 years ago when I founded Homebodii. Knowledge and determination is key; the rest is hard work a little bit of lady luck!